Peter Tillotson, business development manager at tyre pressure monitoring specialist, TyrePal, discusses the top three traffic technologies set to revolutionise truck safety in the near future. According to a recent report from the UK’s Department for Transport, heavy goods vehicle (HGV) traffic is 7.5% higher so far in 2017 than it was four years ago, making it the second fastest growing traffic type in this period. With more large vehicles on our roads, safety, efficiency and driving conditions need to be considered as a priority by fleet managers. 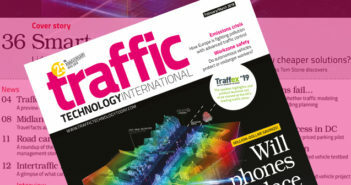 Here Peter Tillotson (above), business development manager at tyre pressure monitoring specialist, TyrePal, discusses the top three traffic technologies set to revolutionise truck safety in the near future. It’s been two years since the world’s first self-driving HGV hit the roads. The 18 wheel Freightliner Inspiration will one day help to make long-haul road transportation safer, more cost effective and better for the planet. Other key autonomous HGV trails that are underway involve platooning — a technology that uses V2V technology to form virtual links between vehicles, allowing them to run in close formation across long stretches of motorway. Platooning would allow HGVs to drive close together at constant speed to significantly reduce fuel efficiency, however platooning is unlikely to work in all locations. An impenetrable line of HGVs has the potential to cause problems for cars leaving and joining the road. Before the technology is rolled out on a national scale, researchers need to consider the impact on other road users. Lighting roads is a financial burdern on authorities in terms of energy costs. One solution, pioneered and trialled in Glasgow after the city was granted £24 million in government funding, is smart street lighting. These lights are dimmed based on ambient light measurements, and, by harnessing this real-time data, the lights can be dimmed and brightened as needed. Smart lighting offers remote sensing to a central operations centre. This enables clear data feeds and allows manual control if required. Additionally, these lights include a bonus of movement detection. This means data-rich collection of footfall and traffic flow which will aid city planning. Air pollution detection and wi-fi services are also included on the long list of smart-light benefits. Despite new regulation stating that all passenger vehicles manufactured in Europe must have tyre pressure monitoring systems fitted as standard, this does not apply to commercial vehicles and HGVs. Vehicles can be fitted with TPMS, leaving the responsibility of tracking tyre pressure with the driver. However, there are also options that fleet managers can take to put the responsibility in their own hands. For example, TyrePal’s TeleTPMS helps commercial fleet managers continuously monitor vehicle and trailer tyre pressures remotely. It will also send alerts via text or email to the fleet office, warning them of a potential problem in the very early stages, severely reducing the potential of a blowout or tyre fire. In the event of a puncture, the system issues warnings so drivers can take action before a tyre becomes permanently damaged. The TeleTPMS comprises of a set of sensors fitted to the tyres of vehicles and trailers in the fleet. A smart TeleTPMS module collects and processes tyre data, together with GPS location. The devices transmit this information to a remote database that managers can access via a web application.